Germany. The REWE Group (pronounced Re-ve) is Germany’s second largest supermarket chain. To give you an idea of how ubiquitous they are in Germany consider the town where I live. There is one Aldi store, one Edeka store and three REWE stores. The gin is part of REWE’s “Feine-Welte” gourmet line, which covers everything from Avocado oil to Venezuelan chocolate. All Feine-Welt products are branded with the same white/gold colour scheme. As the bottle matches the brand colour scheme it has golden base that works through to a transparent top. The shape also changes from completely round at the base to almost square at the top. (I’m now beginning to worry I have a gin-bottle fetish). As for the gin, the bottle tells us that it’s “Fünffach Destilliert” – distilled five times and that it’s signature botanical is Neroli Extract. As my good friend wikipedia informs me, Neroli is the taken from the blossom of the Bitter Orange tree, so we are expecting to add a little citrus to our mix. Day or Night Gin ? It’s a respectable 40%, so you could have a little gin mixed with the REWE Valencia-late harvest orange juice, whilst enjoying a lunchtime picnic of the “Feine-Welt” gourmet line. As an aside, I can recommend the “Feine-Welt” vanilla ice-cream; it’s excellent and is totally free of additives, colours and artificial flavouring. What does it smell of ? Quiet a strong floral bouquet, but very little juniper. What does it taste of ? It’s quite a smooth gin. A little juniper at first, followed by a rather pleasant mix of the bitter-sweet citrus taste and something spicy, probably cardamons. A short, slightly spicy, finish. Paired with a tonic water you have a very good G&T, with the gin flavours adding and enhancing the quinine from the tonic water. Buy It ? You’ll need to go do to the REWE for this, €12.99 for 70ml, or you can order it for their home delivery service here. Overall ? 4 out of 5. This was my favourite gin from our 6 gins deathmatch. It’s not perfect, but it’s very good value. Try it and feel free to add your thoughts to the comments section. This entry was posted in Gin Reviews, REWE Diamond of Marrakesh and tagged deathmatch, Feine-Welt, Gin, Gin and Tonic, gin review, London Dry Gin, REWE, REWE Diamond of Marrakesh. Bookmark the permalink. I tried this gin today for the first time and I love it. I am really into essential oils and their benefits. I love Neroli oil and I love Gin. Having these two mixed is great! And I can understand your bottle fetish with this one. This bottle is really stylish!! Thanks for the comments, I always love to hear what other people think of a gin. 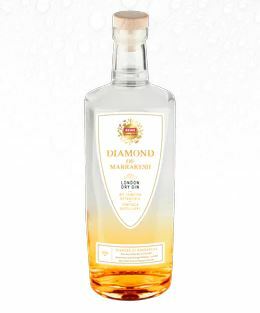 The Diamond of Marrakesh is quite an amazing gin for a supermarket brand. PS. The bottle is special, but still not quite as special as the Tanqueray 10 bottle which should get an award for its design ! Good description of the tast. I discovered this gin a few days ago and was impressed by the rather complex mix of flavors. I really like gins that are more on the juniper side (the classic Beafeater is one of my favorites). But that spicy cardamoms flavor gives this one an interesting twist. Works perfectly for me as G&T. Great value for this price. Absolute recommendation! Diesen Gin habe ich zum Geburtstag bekommen. Man kann ihn einfach nur loben. Leider kann ich diesen nicht kaufen. Wederr bei Rewe noch über Online finde ich diesen Gin. Kann mir jemand weiterhelfen? I am a bit disappointed by the REWE feine Welt Gin as the alcohol is very dominant when nosing and tasting pur. With a tonic water (1:3 mix only) the gin almost loses all of its (botanical) taste. I clearly prefer London No.3 even if it is more expensive.